We reached the venue just before doors opened and the queue was not very long at all. We got in quickly and were able to secure a spot in the second row, behind some other die-hard fans who had traveled to Stockholm from all over the world. Represented in one little group were fans from Finland, Hong Kong, Russia, England, Belgium, France, Spain, Mexico, America, and yes, even one from Sweden! Turning around and looking up from the standing floor area, one could see a seated area on the second floor behind a pane of glass, which housed the fans who bought the second wave of tickets that were released at a later date. From the ground perspective, it felt almost like they were students watching an operation in a medical school. Seated fans at a rock show? It was a bit unsettling, to be honest, but quickly forgotten once the music began. Mew played a very straightforward set with very little chatting between songs, especially when compared with the show they’d just played in Helsinki. 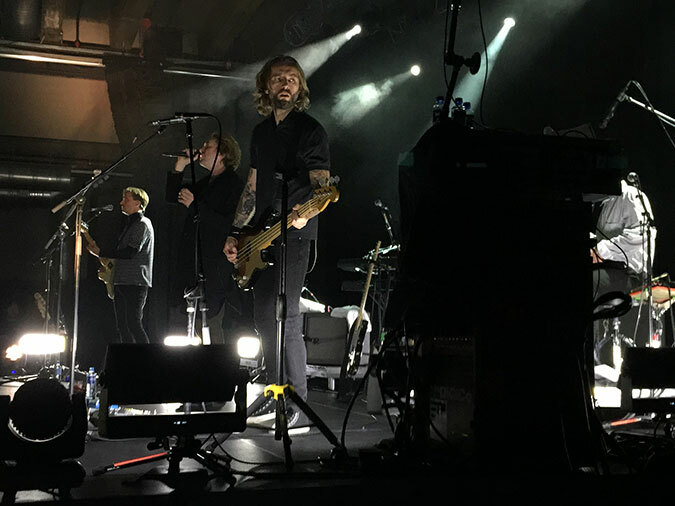 The setlist for Debaser contained extreme contrast between very new and very old songs, as promised by the band before the tour began. To make room for such changes, this was the first time in recent history that Am I Wry? No and 156 were dropped from rotation. Instead we were treated to such old gems as Coffee Break, Symmetry, and Panda as well all five of their brand new songs. Symmetry absolutely shines with Jonas Bjerre singing both vocal parts himself, accompanied only by “The Sweet Doctor Watts” on keyboards. I overheard many people say they were in love with this version as compared to the duet from Frengers. 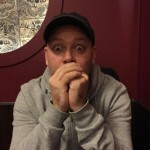 Bo Madsen seems to enjoy talking about the making of the video for Panda in which Johan Wohlert is a waiter trying to serve the rest of the band Bailey’s from a silver tray. Mew had to restart Silas the Magic Car twice due to a weird buzzing in Johan’s monitor. It was pretty funny and cute to see them act a bit more casual and human when a technical problem occurred, then pick up again as if nothing had ever happened. Jonas wore his long trenchcoat during the entire show, even keeping it on after commenting on how hot it was in the room. Even dressed in just a t-shirt I was roasting. How he is able to do this and sing his heart out without passing out, I have no idea. All in all, a very solid show filled with a mixture of songs I never expected to hear in the same setlist. Of all the venues I’ve seen on this tour, Pustervik was by far my favorite. It was most like the venues I know and love from back home in Seattle, and any comparisons drawn were only further enhanced by the entrance walls which were covered in Sub Pop Records memorabilia. (Sub Pop is a very famous music label local to Seattle, best known for signing Nirvana back in the early 90s.) The guy running the coat check seemed disappointed I knew nothing about Seattle sports teams, but when I quizzed him about music, he knew nothing about that either, so I guess that makes us even. The inside of the venue had the feel of a tiny converted gymnasium. Basketball hoops were mounted stage left and right. During one of the chatty bits between songs while Bo was tuning his guitar during an improvised setlist change, Jonas decided he should make up an anecdote. After looking around the room for a bit he decided to comment on the setting. “This place looks like a gym. You know, it has the baseball thing–uh…oh, it’s basketball, isn’t it? I don’t know anything about sports. It’s a bad anecdote.” Naturally this got big laughs. Johan spoke to the audience quite a bit in Swedish, and the one thing my English-only language skills were able to pick out was the fact that the song they’ve so far called Russle (after Russell Lissack of Bloc Party who helped write the guitar riff) will officially be called My Complications on the album. This song was substituted for Panda and Eight Flew Over, One Was Destroyed which were both written on the setlist but not played. The sound in this venue was spectacular. From my position at the front of stage left, everything sounded great. You know someone has done something right if you can get sound like that without standing directly in the center. The band members were all in quite jovial spirits all evening, everyone really appearing to have a blast on stage. The chemistry between the guys is so apparent, and they really feel like a complete unit now that Johan has returned. The design of this place gets a big thumbs down from me. There were some rather poor decisions made in layout. First off, there was no option for coat check so everyone had to either wear their coats or find something else to do with them. Mine ended up on the floor against the wall, where I hoped it wouldn’t get covered in beer from enthusiastic fans. Naturally this added bulk and heat to an already small and crowded space full of drunk people, which didn’t earn them any points from me. The bar was located right at the entrance which meant everyone entering had to pass through the line of people trying to buy drinks. I was fortunate enough to find a tiny corner near stage left, almost exactly in the same spot I’d stood in Gothenburg. I felt lucky to have a breeze coming through the backstage area, so I had some reprieve from the heat. Despite the temperature in the room, Jonas again kept his long trenchcoat on during the performance as he had in the previous shows. As this was the fourth show in five days, the band members were beginning to look and sound a little tired. I was exhausted from travel myself, so I can only imagine how they must have felt. 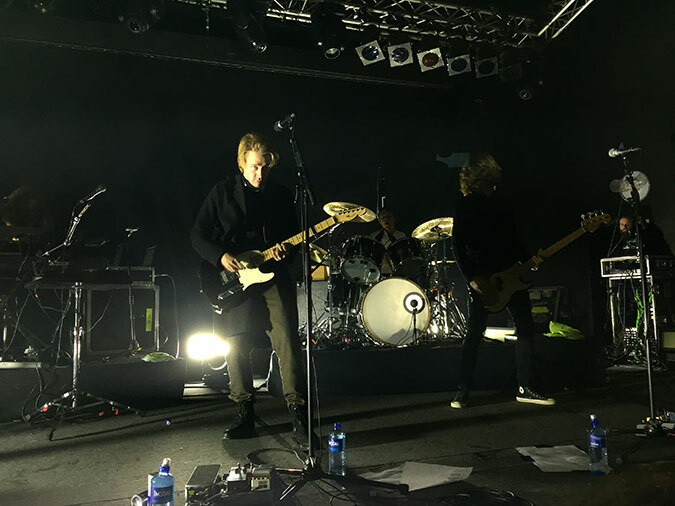 I watched Mew’s tour manager bring out Jonas’ special warm, soothing throat concoction and place it on the stage where he gladly sipped from it, as an alternative to his usual water and Red Bull. 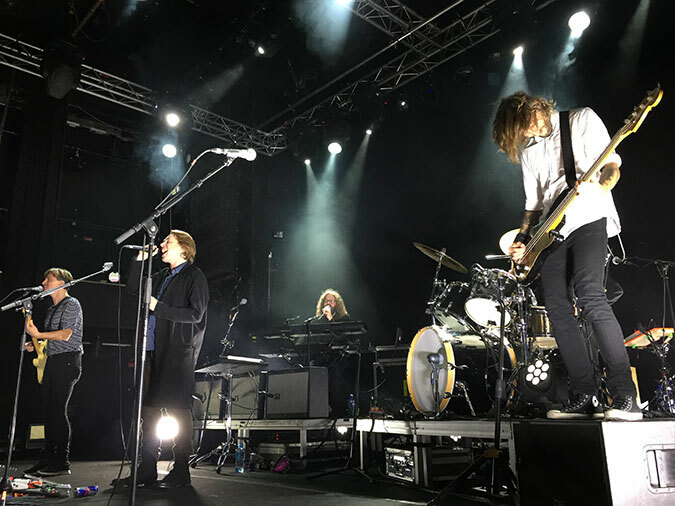 Since I’d just seen them perform three times previously I was easily able to sense their exhaustion, and feel like they were preparing to rally for their big show in their hometown of Copenhagen. 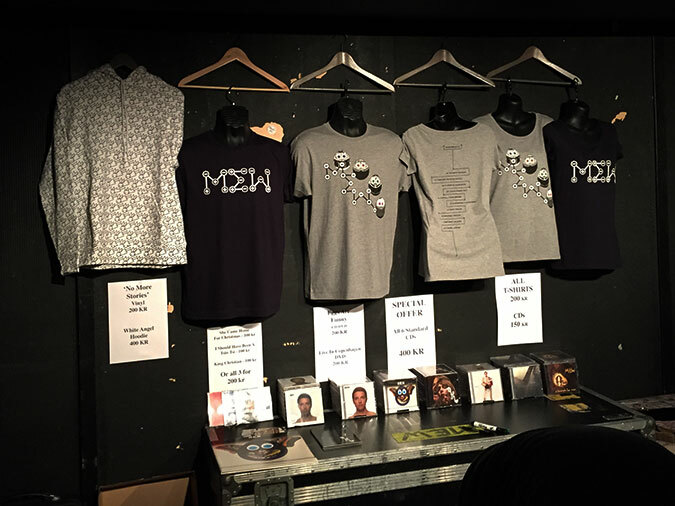 It seems as if Mew has chosen many of these venues for personal or sentimental reasons. They are all places they’ve played in the past, some from the very early days. As everyone knows, they could easily have sold out venues of quadruple the size of any of the ones on this tour. All of them have some sort of quirky charm that separates them from larger venues. I have only ever seen Mew play in venues of less than 1500 people, and never in a festival setting, so I know I’m in a very lucky minority when I say I really enjoy seeing them this way. It is thrilling to be able to stand within a few meters of any of the band members and be able to make eye contact with each of them as they perform. To see the sweat flying off Bo’s forehead from clear across the room, to see the expressions lighting up Johan’s face as he talks about his return to the band after being away so long, to see the air in front of Silas’ drums vibrating with each beat, and to make physical contact with the band members when they hug or shake hands with fans in the front row as they leave the stage. That is something truly special. I will be forthright in saying I really do miss the animated visuals. They were such an integral part of pulling me into the Mew world during a show, that I feel these shows were only half-complete. The strobe lighting is incredibly harsh, especially in close quarters. In many instances the strobes are located at eye-level for the audience which can make watching the shows nearly painful if you are near the front. They also make taking anything resembling a good photograph nearly impossible. I’ve been told the animations are being re-worked for future shows, so I am hopeful that there will be some return to original form the next time I see a Mew show. Of the five new songs, Waterslides is my clear favorite. It is incredibly catchy and has “Hit Single” written all over it. I’ve already watched the video I took of that song from the Helsinki show countless times and find myself humming the chorus on a regular basis. 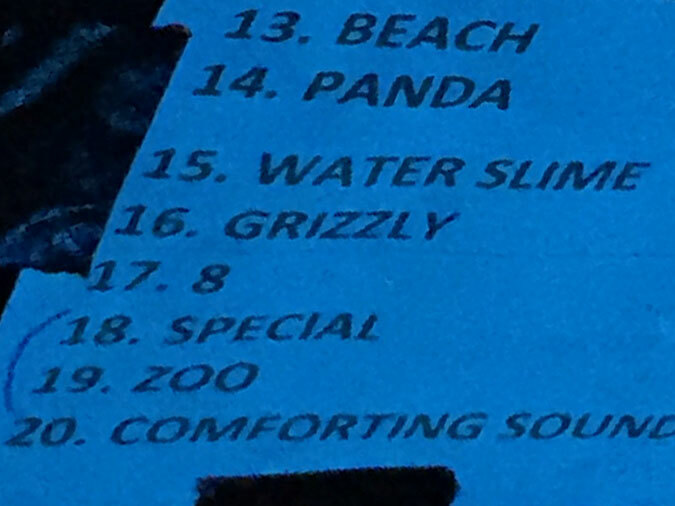 (I was quite tickled that the printed setlist from Gothenburg listed the song as “Water Slime.”) From what I’ve heard thus far, it seems like many of the songs from the new album will be more radio-friendly than those from No More Stories which (at least in America where I live) got virtually no airplay. As far as merch goes, there were only two new t-shirts available, both based on the new logo and distressed egg portraits. Everything else has been seen previously. Most notably (and quite unexpectedly, I might add), CD singles for She Came Home For Christmas, I Should Have Been a Tsin-Tsi (For You) and King Christian were also being sold for a very reasonable price. Great stuff. It was like reliving the concerts!